Makes his Mama’s heart want to burst with pride. Although I could do without the 6AM shake-awake to get me to check the weather app on my phone so he knows what kind of clothes to pick for the day, and what kind of shoes and outerwear to plan for. Kid, can’t that wait until the alarm goes off at 7? Mama needs all her hours of sleep; otherwise you’d best be waking me up with the Keurig warmed up and that first cuppa joe already brewing. I’m kidding, kind of. There’s more to scouting though than just general preparedness, pocket knives, and knot tying. Camping, obviously, among others. It’s more than just learning how to pitch tents and fish, although to be fair- they do do both those things. What we didn’t know they did, is teach the boys to actually cook while they’re camping. I’m not talking just ramen noodles or roasting hot dogs either, but actually making a meal. The first two things my son learned to make in a dutch oven over a camp fire? Pizza & monkey bread, and both were dee-licious. Once the nights turned colder though, the boys’ and the adults both needed something heartier, cozier, and much hotter to warm us up from the inside out. 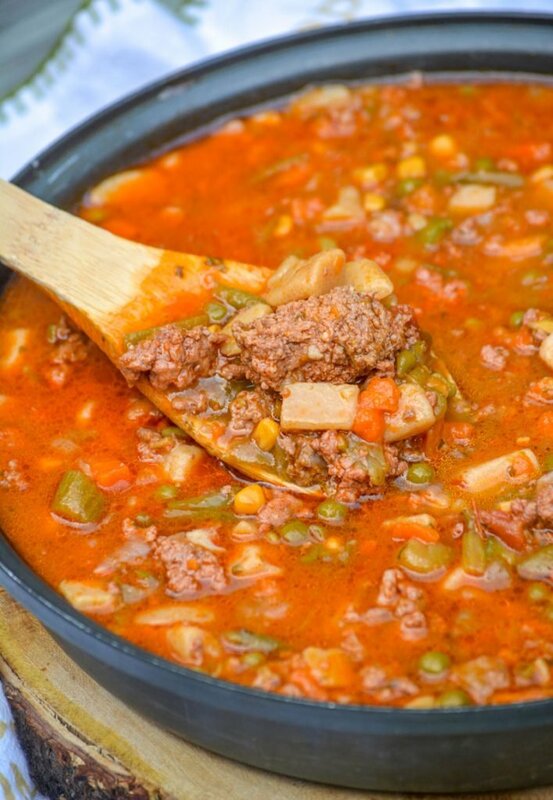 Which is exactly how we came to know, and love, this Campfire Stew. A dutch oven is a magical thing, and even better when you know how to use one- both at home and away. We’ve always used them in our home, but I truly had no idea how vital they could be to a real meal when away from home. I mean, I’m all for roughing it for a few days, but if my food can taste like ‘home’ and not the ‘road’ or the ‘forest’- well, that’s even better! They’re so great, they can do so many things- that bringing this single pot along on your trip is like packing a kitchen’s worth of pots, pans, the stove top, and even the oven. That’s a lot of options to bring, and have at your disposal, without any added weight. According to the Scouts website, “It can be used to fry, sauté, bake, stew, roast or slow cook — any time of day and for nearly any type of meal. It’s not uncommon for a single recipe to involve several cooking methods using the same oven.” Sounds a bit like the OG Instant Pot to me! Don’t be intimidated by talks of cooking over camp fires, and what not. 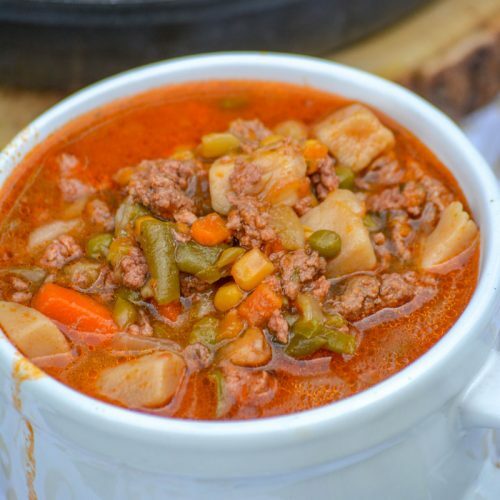 Our Campfire Stew is the easiest dish to throw together, and (because let’s face it, we’re not all cut out for outdoor living like that) we’re also going to tell you how to make it in the slow cooker AND on the stove top. I wasn’t kidding when I said easy. It’s four ingredient easy! Ok, ok- before someone complains, because with my luck there’s always one. Even Rachel Ray doesn’t could salt or pepper on her ingredient lists, and she’s a celebrity chef. So, I think it’s ok to take my cues from her on that front. 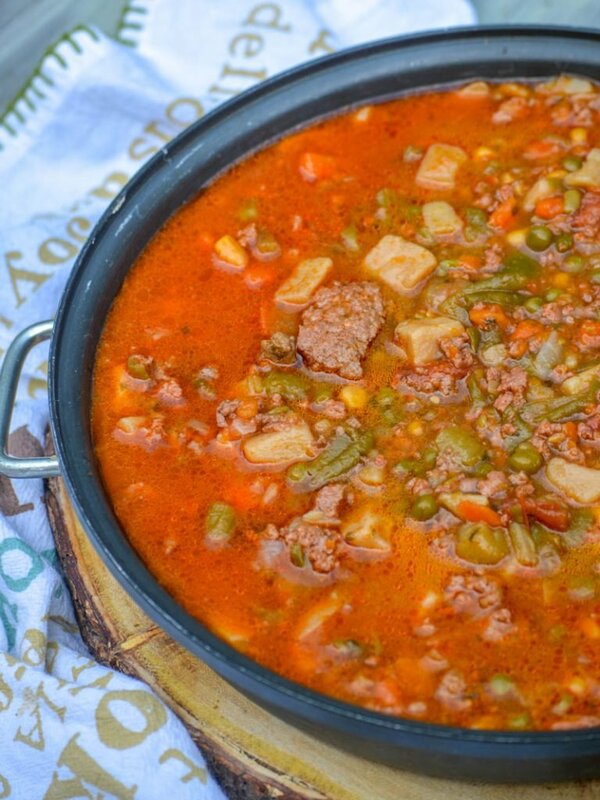 As I said, only FOUR ingredients needed for this delicious, savory Campfire Stew. As the recipe is written, it’s a perfect meal the whole family can agree on. When you get home, you simply brown your ground beef, drain, then dump the remaining ingredients straight into the pot. The stew’s brought to a boil, and then reduced to simmer for 30 minutes. 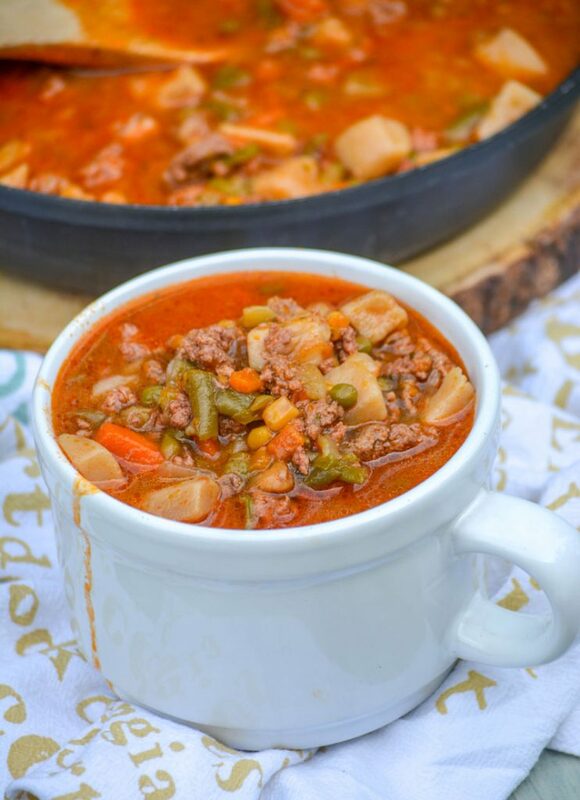 Ladled into bowls, it’s perfection when served with a thick slice of your favorite crusty bread. But, as I mentioned earlier- you have options! 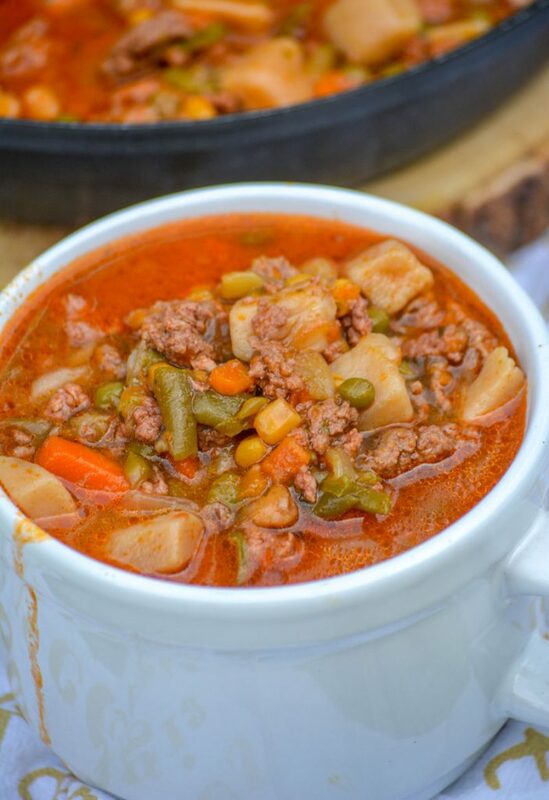 This can be made, as originally intended, over the campfire, or in the slow cooker. I love when I have options! To make it over the campfire, you literally follow the recipe as written- browning the beef, draining, dumping all the ingredients in, and then simmering for 30 minutes. The only difference? You’re using the heat from your camp fire, if it’s suspended over it, or setting it slightly above hot coals (depending on your dutch oven) instead of the range on the stove top. Need dinner to be ready when you get home? Or do you want to set it, forget it, and go about the rest of your day until the hoard is hungry? 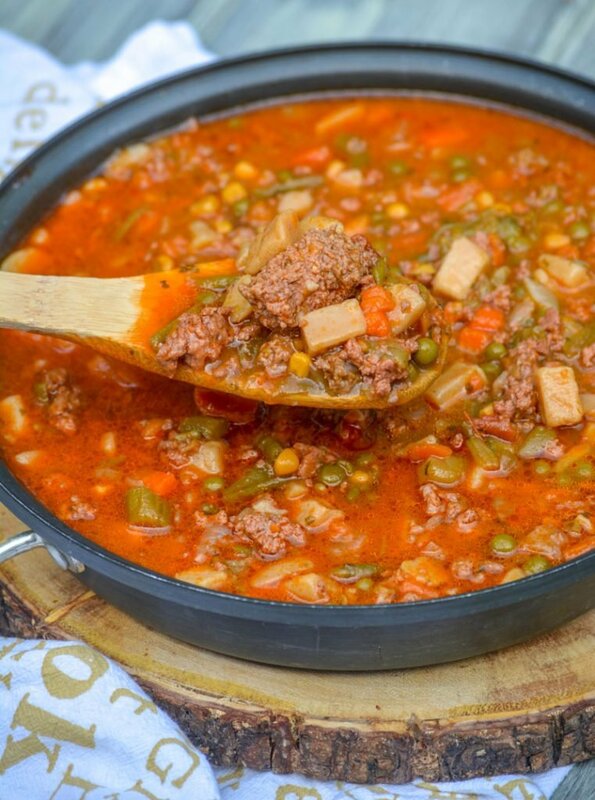 Prepping this Campfire Stew in your slow cooker will save the day. In a skillet, add the ground beef, pepper, and onion. Cook, stirring occasionally, until the beef’s broken up and browned through and the onions and peppers are soft. Strain the meat mixture in a colander, then transfer to the bowl of your slow cooker. Add the rest of the ingredients to the slow cooker, stirring to evenly combine. Cover, and cook on low for 2-3 hours. Heat a dutch oven over medium heat. Add the ground beef, stirring & breaking up as it cooks. Continue cooking until cooked through completely, no more pink remaining. Strain the fat, and return the meat to the pot. Add the onion and pepper, stirring occasionally, and cooking until they've begun to soften. Stir in the cans of soup. Season the soup with salt & pepper, to taste. Bring the mixture to a boil. Reduce the heat, and let the soup simmer for 30 minutes. Ladle the soup into bowls, and serve with thick slices of crusty bread. 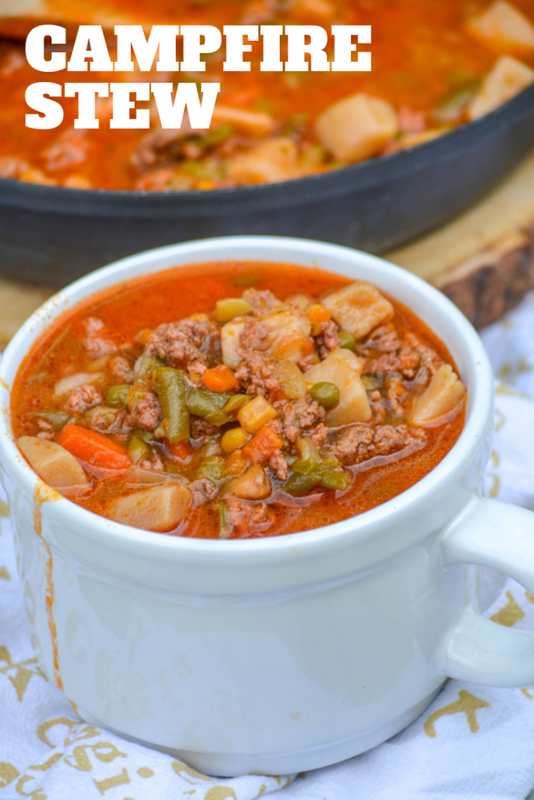 This recipe can easily be made over a camp fire, or in the slow cooker. Refer to the notes in the post for instructions on those methods!